Easy-to-install and even easier to use, it has a bright 4.3 inch display that is easy to read on a sunny day on the water. 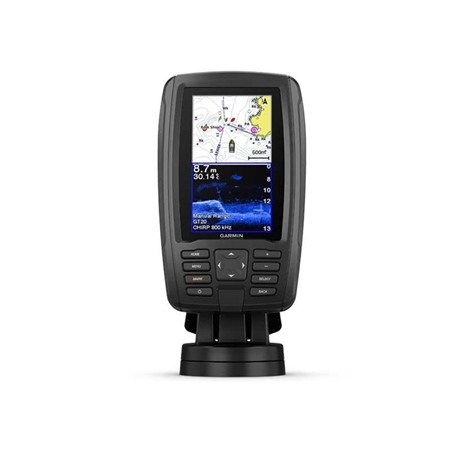 It features built-in support for Garmin CHIRP traditional sonar that delivers remarkable target separation and CHIRP ClearVu scanning sonar for nearly photographic images of what’s below the boat. Preloaded with BlueChart g2 charts for the U.K., Ireland and the Northwest mainland Europe coast. Quickdraw Contours mapping software to instantly create personalised fishing maps on-screen with 1-foot contours as you fish. You own these maps. They are yours to keep private or share with the Quickdraw Community on Garmin Connect. You can share waypoints and routes with other ECHOMAP or STRIKER units. It also features a quick-release mount allowing you to quickly remove your device from power and mount. This unit does not come with a transducer. A suitable one for this product can be found here.